Ora et Labora, Uwe Rosenberg's fifth "big" game, has game play mechanics similar to his Le Havre, such as two-sided resource tiles that can be upgraded from a basic item to something more useful. Instead of adding resources to the board turn by turn as in Agricola and Le Havre, Ora et Labora uses a numbered rondel to show how many of each resource is available at any time. At the beginning of each round, players turn the rondel by one segment, adjusting the counts of all resources at the same time. 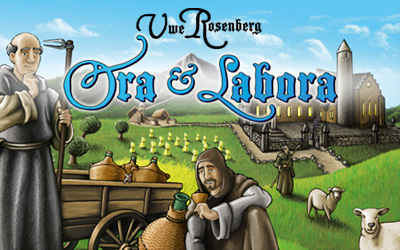 Unless expansions start dropping like hotcakes, Ora et Labora lacks any significant replay value. The game doesn’t have random card distribution like Agricola, so each play is the same game. You can mix it up only slightly by playing the French version of the game or the Irish version, but once you’ve played both, you have played the whole game. The card distribution and options are always the same and do not change. You’ll get three good plays out of it, maybe, and then the game just becomes efficient “engine” making. If this game’s components are what’s to come from the new Z-Man, we should expect many years of let downs. The player boards, reference sheets, and extension tiles are super thin. Extend play with normal amounts of skin oils will likely prove problematic. In addition, the rondel which is easily the most icon part of the game, is super thin and requires taking apart when you want to play the game with certain combinations of players. A huge let down overall. This isn’t a complaint of the overall strategy involved in the game. The level of strategy is about right, in league with Agricola and other similar games. This is however a warning. This game is very complicated the first time you play it. In addition, it’s almost impossible on your first pass to grasp who is winning. Scores are generally in the 200-300 range, made up of series of small scores (5-15 pts). I do like the game, don’t get my wrong, but I’ll always like it from a distance (aka, playing other people’s copies). The game doesn’t have enough replay value (right now) to warrant a purchase. Oh, and the components are greatly lacking for the price. I have been an Uwe Rosenberg fan since Agricola came out. And while I love Agricola and have a higher chance of getting my wife to play that, Ora et Labora is in my opinion the height of Uwe’s abilities. He took all he learned from Agricola, Le Havre, and Loyang, and perfected it. Gone is the harsh reality of “eeking out a living” on a farm, where you struggle to feed your family while barely making a solid farm. In the case of Ora et Labora, you continually work to use your own buildings and the buildings of your opponents. The number of resource chits is astounding, and while it may seem a bit dissapointing that the woodies are limited to 1 each, once you’ve played teh game, it is obvious why the publisher decided to do this. If each of the resources was made in woodies, yes, they would be a fantastic addition, but the game’s value would have doubled in price, if not tripled. While this is not an easy game to learn, it is not as hard as Le Havre. Work your way through a turn, and you’ll be rewarded. This is not a game you’ll need to play one turn and then start over. Simply follow the rules for set-up and play, and when you’ve played through the game, go back and read all the hints that Uwe Rosenberg has personally given you. This is a game with no secret knowledge. The creator himself tells you why you would want a particular building on your lands. If you have not had a chance to play this game, seriously consider doing so, if you’re into Farming games. Add a Review for "Ora & Labora"